* Lime In The Coconut: Shower thoughts?? hard to see the linen...but it is there. trust me. Oh... LOOK! the toilet seat is down. Miracle of miracles... ...Thoughts? I love it, Linda. It's probably going to be too short though. Got a plan? Going to pin some linen onto it? lol. I say go for it. It's slammin'. Yeah...I figured that I would need to "augment it" Maybe with a dark brown canvas...maybe with buttons made of little sticks. Is that crazy?? I don't care for it too much, but that's just me!!! If you love it - do it. The room is very organic looking so it plays into that theme very nicely. Why not save your money and get a frameless shower door in a year or two? hahah I want one of those soooo bad!! btw - I LOVE your blog - it's my fav right now. I think it works really well in your bathroom. :) My son would love it! I just want to say: If I had a bathroom that looked like that, I would never come out of it. I love the root holding the towels. I agree with Joni, Linda. I like the shower curtain, but for your bath, something simple and textural is all it needs. Joni-Yes...Frameless shower door...we thought about turning it into a shower and doing that....but wanted at least one tub in the house. Your FAV blog right now...I'm verklempt!! Ya made my day!! Ms. Tee...well that is what i was thinking about-The kids...but really, they are not so attached to ANY shower curtain...who am I kiddin'. Yep, Sandra, I hear ya...and like Joni said save the $$. Always a good reminder! Man, I just can't get enough of that bathroom. It is sooo up my alley. I also love the tree shower cutain. 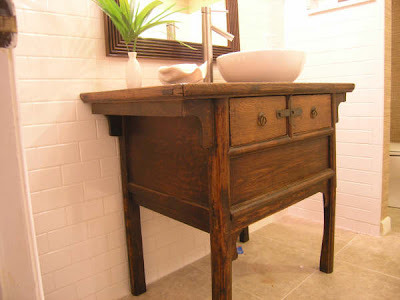 I really think anything with some brown in it would balance out the dark wood you have in the vanity area. Plus, I love anything with trees, leaves, etc. Go for it! Hmmmmm, I'm tilting toward the current textural thingy...BUT, LOVE the idea of twig hangers. but that tree is great! My way of thinking is....Keep It Simple Stupid!.....Sounds like the tree shower curtain might be a little troublesome having to "augment it", so I think the bathroom is so FABULOUS that I would stay with a simple natural look and maybe something with a border.........but if you like the tree, Linda, go for it! First time stalker of your blog and I know I will be back for more! Yes, Joni knows best. I love your altar table/vanity and the grasscloth wallpaper and the zen look you have going on. Although cute, I think that shower curtain would detract from the rustic elegance you have going on. Ok You all....After looking (online...not touching) the curtain, i think it might not have enough weight for the room...I think it is a pretty thin vinyly cloth...and, agree the room could use more texture and substance. Thanks so much for your input...this is my weekend of projects...cough, cough...It's going rather s l o w l y to say the least. I'm off to visit all of your blogs, rather than finish stuff here. Sound good? Sounds good! Linda, What a small world Blogdom is. I see you know both Karin and Chris from my recommendations today. I'm glad you stopped by so that I could add your blog to my list to visit. I love what I've seen so far. I like the shower curtain and it is only a shower curtain...easy to change out should you decide you're ready for a new look in a year or two. BTW, the bathroom is beautiful! I've just spent nearly an hour looking through your older posts. I've enjoyed them all. I could have saved myself a ton of time if I had just found you earlier and picked five people from your blogroll to recommend today! I have added you to mine so that I can keep up with all of your pretty posts. Looks like the weight of the curtain helped answer the questions. Coincidentally, I've been debating stenciling a simple tree outline on my heavy natural colored shower curtain. When I finally get to it, I'll surely blog about it. Maybe some kind of compromise would be the solution for you...linen with a simpler graphic. Whatever you do, your bathroom is already quite lovely! Wow - love your bathroom! 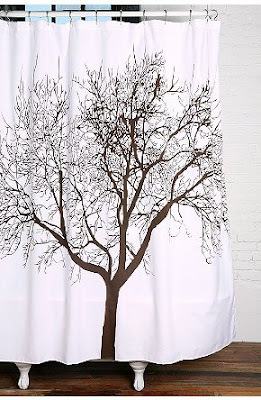 The shower curtain is neat - but we like the idea with the twigs on the rings....that would be just enough in there. We like the sign you have above the toilet - that is great! Thanks for stopping by to see the tractors! Ahhhh.....we must get back to them today - one more time until next year! THOUGHTS? Other than your bathroom is FANTASTIC??? Bridget...check out the blogs in my roll...they are ALL that good. No...better! You are sweet! Karin...I knew it had to be something...played around with it a bit.At first I thought of more of a hook...then the rolled towels just fit. Maya...whatever YOU do will look stunning, and organic and lovely! Karla, Karie, French and Marie...Thanks...and welcome!! I see you've made a decision about the curtain. I am agreeing with Joni, on this one. I do love that twig, though! I don't care for "traditional" towel bars, so I think the style of the root rack is unique and compliments the decor. I have four types of shower treatments in my main (guest) bath! I like curtains rich in color and texture, for my guests. Is this a shared bath with visitors? If it's solely the kids bath I say they'll be happy with any designs as long as they have a tub to carry the arsenal of tub toys and scuba gear! I can't believe I said that!!!! I must have been on drugs. I'm sorry. It's just that your bathroom is fabulous as it is! I don't know, I like plainer things I guess. anyway, I apologize for being so blunt earlier and here I am again still not loving it. hahah!!! so rude!! are you getting it anyway despite my rudeness? Pat and Sarah...Thanks! Sarah, they are not so much tub toy kids anymore...more like radio in the shower teens! Joni...No I'm not getting the shower curtain,because I need to save up for therapy because of your "rudeness". PUHLEASE, Girl! I ASKED for thoughts. You thought. You spoke. I love ya for that! Appreciate EVERYONES comments. 'Cause I'm nice that way. Hi Linda, I'm Donna. I found you over at Frenchkilts... I love your blog! I also love that shower curtain and your sink! I like the curtain by itself but your bathroom is lovely enough as it is...I wouldn't want something so bold and graphic to take away from the beautiful little textures elsewhere. Oh my goodness that root..........! Hey, I am on your blog daily, but post rarely, sorry. i am very thankful for you, I credit you as having the best taste in blogrolls, thank you for the time you put in!!! I have noticed your bathroom before on here, and loved it too. Happy New Year!! !